Great townhome with lots of space, an attached 2-car garage, and close to everything. Very well-maintained, totally move-in ready with new interior paint. All appliances in the kitchen, all new carpet, and a great loft unique to this floor plan. Living room includes a 2-story vaulted ceiling, brick-surrounded fireplace, and a sliding glass door that opens to the private, fenced yard with patio and new sod. Large master bedroom includes a double closet, vaulted ceiling, and 3/4 bathroom. The basement bathroom has been completely renovated. 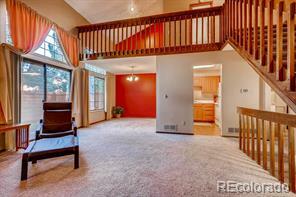 Easy access to Cherry Creek State Park, local shopping & I-225.